Morgan Hill, Calif., March 7, 2016 –- Volanti Displays today announced it has signed an OEM partnership agreement with HP for its high-end CAD workstations to meet the specialized needs of touch-screen display and touch-screen table customers. These will be integrated in Volanti’s innovative Lift & Tilt touch-screen workstation table, which can be used with graphic intensive applications, such as Autodesk’s Revit, SOLIDWORKS, Bluebeam, Procore and other industry software leaders. It can incorporate an Intel® CPU for a powerful workstation experience with NVIDIA Quadro graphics and SSD (up to 1TB). 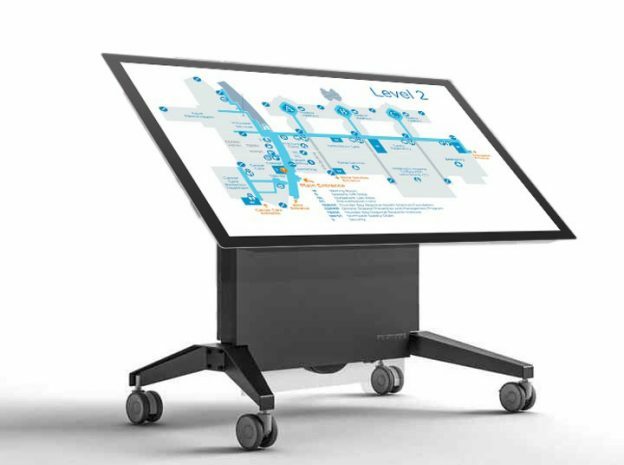 The ample workspace of the Lift & Tilt display and the electrically adjustable height and tilt angle enable group interactivity, ideal for team review of collaborative or CAD and data driven applications. The ability to adjust both tilt and height allows for both the most ergonomic position as well as moving from personal use through to full presentation use. Application examples include architecture, engineering, construction, and surveying or geology for government and industry. Utilizing a completely flat Ultra-HD 4K (3840 x 2160) screen, the Lift & Tilt touch-screen workstation is a stylish addition to Volanti’s family of touch-screen displays that are designed and assembled in its California facilities. The base has robust drive mechanics to provide both display lift and tilt to move from completely horizontal to vertical. The unit features the highly responsive clear InGlass touch technology, flat ‘no raised bezel’ surface with toughened edge-to-edge glass that is sealed to protect against minor spills. 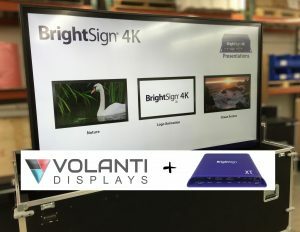 Morgan Hill, Calif., November 16, 2016 –- Volanti Displays today announced the integration of BrightSign’s new Series 3 XT model media players with its large 4K touchscreen monitors. Volanti’s 4K Ultra-HD touchscreen monitors are available in 55”, 65”, 84” and 98” sizes designed for corporate and digital signage applications. The BrightSign XT media players support very complex HTML5-based interactive digital signage applications with up to 4K 60Hz HDR video and the option of incorporating a live video or live TV feed. The automatic player setup and deployment cloud networking feature make for an extremely easy to deploy solution. Another way in which the Volanti touchscreen display and BrightSign media player work well together is touch response speed – the 100Hz touch sensor, the 60Hz video display refresh rate, and the fast solid state media player combine to provide a near instant response. “It is exciting to see a dedicated media player running 4K content and being able to provide fast multi-touch support with enterprise-level robustness and reliability,” said James Henry, Volanti CEO. New ultra large 4K display table offers a dynamic multi-touch solution for collaborative applications. Morgan Hill, Calif., November 8, 2016 –- Volanti Displays today announced the availability of its Lift & Tilt touchscreen table with a 65” display. The ample workspace of the display and the electrically adjustable height and tilt angle enable group interactivity, ideal for team review of collaborative or data driven applications such as those used in surveying or geology for government and industry. Other fields benefitting from the same level of interactive group settings are architecture, civil engineering, and construction. Utilizing a completely flat Ultra-HD 4K (3840 x 2160) screen, the new Lift & Tilt model is a stylish addition to Volanti’s family of touchscreen displays. The base has robust drive mechanics to provide both display lift and tilt to move from completely horizontal to vertical. The unit features the highly responsive clear InGlass touch technology, flat ‘no raised bezel’ surface with toughened edge-to-edge glass that is sealed to protect against minor spills. “Large digital work surfaces are compelling when reviewing visuals like designs and maps. Users quickly find that the ability to set the display angle further enhances the usability, particularly for group discussions,” said James Henry, CEO of Volanti Displays. The display is designed for commercial use with a selection of optional accessories, including a roll-in/roll-out road case. The touch table display has high reliability, low latency industrial grade display electronics for an optimal user experience, and has optional storage compartments that provide for power cable and accessories. The touch glass is high transmissive, chemically toughened 3.2mm thick, with impact resistance measured to ball drop UL60950 (500g/1.3m.) The display size is 60” x 35.4”, with vertical travel of 24”. It comes in multi-touch options of 10 or 40 point and is compatible with Windows 7/8/10, Android and Mac. A 55” version is also available. Founded in 2014, Volanti builds on over 25 years of its founders’ display industry expertise and focuses on large display systems for niche commercial markets (such as corporate, digital signage, and way-finding.) In addition to standard models, Volanti Displays produces LCD video displays with options to suit specific market and application requirements – in sizes from small to very large (98″,) including touch and non-touchscreen models. Offering innovative display products with cutting-edge technology, Volanti designs and conducts final assembly in the USA. Morgan Hill, Calif., October 24, 2016 –- Volanti Displays today announced the availability of high resolution multi-touch video walls, offering configurations of 3×2 (153” diagonal) and 5×3 (252” diagonal) displays. The displays, with optically-bonded glass, are bright and the color temperature can be set to match various lighting environments. The touch video walls are ideal for both team collaboration applications, where touch capability is invaluable, and high-end presentations. With suitable setup, multiple sources can be used and interacted with across the large visual canvas. “We consider the 3×2 to be optimal, as it provides a stunning interactive workspace or a high impact visual experience. 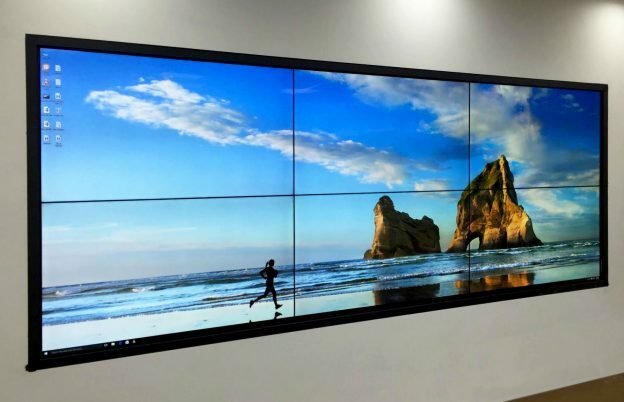 It can be run off a single PC at 5760 x 2160 display resolution using a suitable graphics card without the need for any special video wall controller,” said James Henry, CEO of Volanti Displays. The displays offer LCD with LED backlight, full HD, color of 1.06 Billion, brightness options of 500nit, 700nit, 800nit, and bezel sizes ranging from Super-Narrow to Ultra-Narrow. Morgan Hill, Calif., October 4, 2016 –- Volanti Displays today announced the availability of its interactive 4K collaboration display, utilizing the Trello application enabled by Cnverg Software. Customers already working with Trello can now leverage Volanti’s 42”, 55”, 65”, 84”, and 98” touchscreen displays with expanded capabilities for collaborative group planning and scheduling in the work environment by using Cnverg. Used together with Microsoft Windows 10 and the Edge browser, users can interact with Trello and discuss as well as annotate Cnverg Trello screens without changing its content. Customers can visualize multiple boards in a single, unified workspace, and can plan, sort and prioritize, use whiteboarding tools, and pull Trello boards together. The marked up screen can be shared at any time. “Cnverg is the kind of product our own Trello users have been asking for. 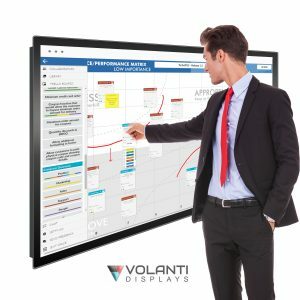 Combined with a large touch display, it gives them the ability to review and plan in a group discussion setting,” said James Henry, CEO of Volanti Displays. Morgan Hill, Calif., September 20, 2016 –- Volanti Displays announced the availability of its 98” Active Matrix LCD display. Ideal for environments that benefit from architectural displays, such as hotels and corporate lobbies, the new display provides a platform where art meets technology for impactful and striking visual messaging. “When someone walks into a place where Volanti’s 98” is being utilized it’s going to get noticed, and the potential for an organization to have a dramatic impact on an individual is enormous,” said James Henry, CEO of Volanti Displays. Volanti’s extensive display command set makes it ideally suited for installations with a room controller, simplifying the task for AV integrators. The large display offers 3840 x 2160 Ultra-HD resolution, 450 nits brightness, 1300:1 contrast ratio, and 1.07 billion colors. It has a powder coated precision-engineered aluminum housing with industry-grade electronics suitable for 24/7 commercial use. 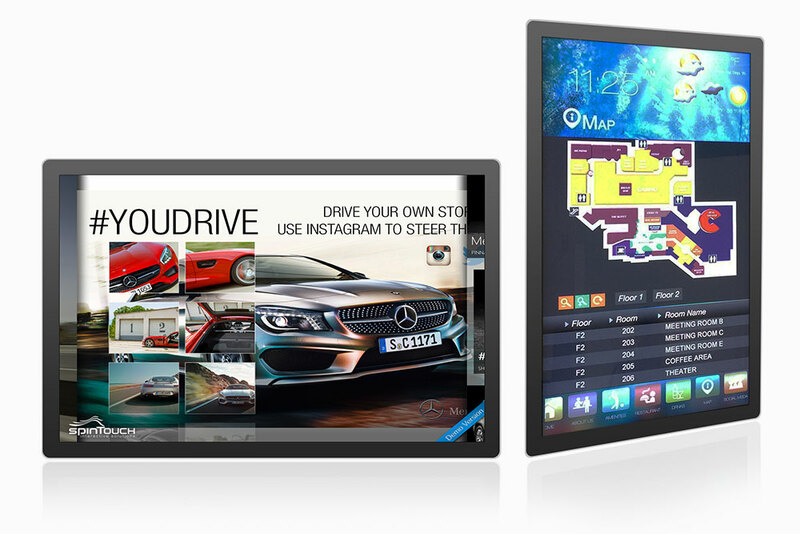 The Volanti 98” display is compatible with Windows, Mac, Android and Linux. Volanti Displays announce the release and availability of their new 65” Ultra-HD touch monitor, the V6500-4KT. With clear glass technology providing unmatched optical clarity and a tablet-like flat edge-to-edge design this commercial grade video display is compatible with Windows, Mac, Android and Linux. Designed to meet the needs of the digital signage and way-finding market for product promotion, advertising and retail navigation applications the V6500-4KT provides 10 point multi-touch and plug-and-play when used with Microsoft Windows. Usability is enhanced by the fast response and support for finger with pressure sensing when used with suitable applications. “Optical clarity ensures promotional looks its best and the unique slim design is so reminiscent of tablet design that people know intuitively that this is a touch display so will more readily interact with it” said Michael Sarich who runs business development for Volanti, “furthermore the 4K Ultra-HD resolution provides a crisp image even when the user is up close”. This entry was posted in touch screen on October 3, 2015 by admin. Morgan Hill, CA – July 7, 2015 – Purchasing video walls and large display systems is now easier than ever. Volanti Displays has teamed up with Taycor Financial to offer financing options to commercial customers. A simple financing calculator helps customers instantly estimate their monthly payment. Morgan Hill, CA – February 23, 2015 – The FORZA mobile video wall was recently chosen to be part of ExhibitorLIVE’s New Product Showcase. The FORZA is the first of its kind mobile video wall. Volanti Displays, a Silicon Valley company, designed the FORZA as a unique solution for bringing video wall technology to any venue. “In the past, video walls weren’t easy to put up or taken down. The FORZA Mobile Video Wall (www.volantidisplays.com/forza-video-wall.html) has changed all that,” said James Henry, CEO of Volanti Displays. “With FORZA, no custom setup or additional labor is needed—just pop and show,” added Henry. The FORZA’s video wall is delivered in wheeled carts that transform into the base and frame. In less than 20 minutes a complete 94” or 110” video wall is ready for use. The FORZA offers high definition LCD technology in models for both indoor and outdoor use. It has an ingenious gas-spring mechanism, simply pop the lever and the display modules rise automatically. The wiring is pre-configured and straightforward and the industrial strength wheels make moving and positioning easier than ever. The mobile video wall is ideal for trade shows, events, trainings, fundraisers, performance artists, museums, galleries or anywhere you might want to engage your audience. For additional information contact James Henry at 408-579-1630 or at james.henry@volantidisplays.com. This entry was posted in Forza on February 23, 2015 by admin. 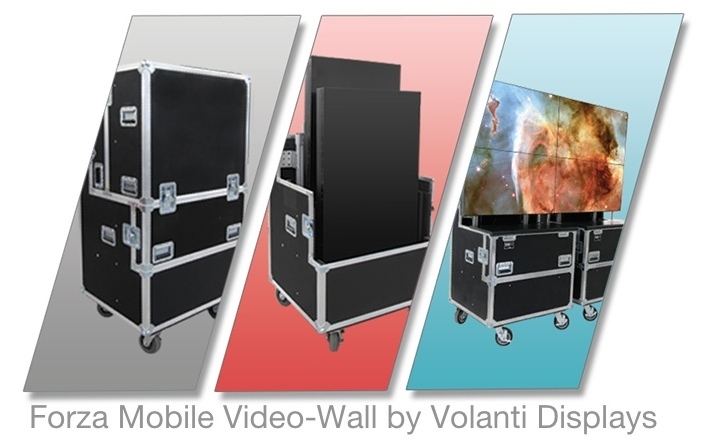 Morgan Hill, CA – February 22, 2015 – Volanti Displays, a Silicon Valley company that specializes in innovative large screen displays, recently unveiled The Cube Gen2 (www.volantidisplays.com/cube.html). The unique 3-D video cube wowed audiences in testing. “The Cube will definitely be the coolest LCD display in 2015. Looks like a door to another dimension,” said Amp Live, a leading Beat Maker/Producer who helped test The Cube in a recent live performance. Originally designed for artists who want to bring an exciting new element of visuals to their production. Measuring 21” on each side, The Cube displays high-resolution 1920×1920 video on multiple sides. The display quality is incredible, consisting of LCD panels using LED backlight IPS technology. “There has been tremendous interest from other market segments as well,” stated James Henry, CEO of Volanti Displays. “The Cube is ideal for trade shows, exhibitions, corporate lobbies, live events and retail digital signage,” added Henry. 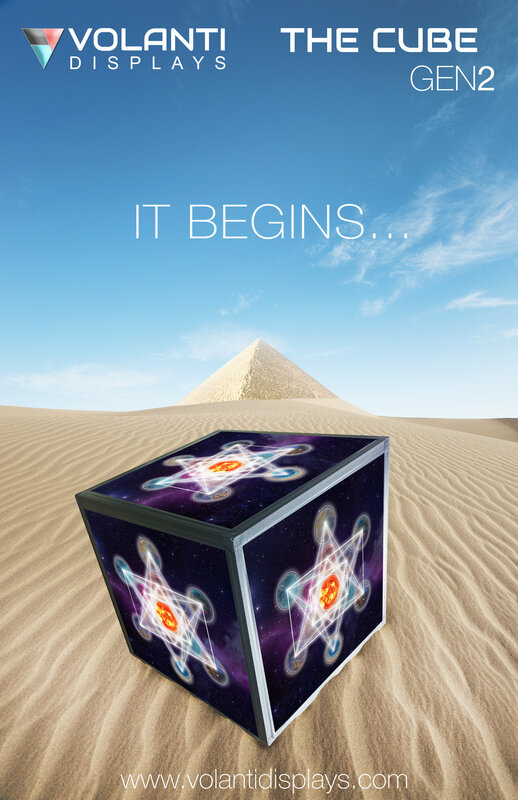 Demos of The Cube Gen2 will be ongoing at the Volanti Displays booth #656 at ExhibitorLIVE 2015 from 11:30 am – 3:30 pm, March 2-4, 2015, Mandalay Bay Convention Center, Las Vegas, NV. For additional information contact James Henry at 408-828-6739 or at james.henry@volantidisplays.com. 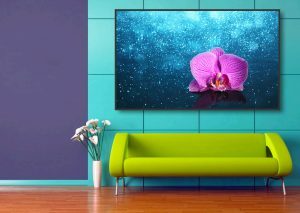 Founded in 2014, Volanti builds on over 25 years of display industry expertise and focuses on large display systems for niche commercial markets. Innovative products and cutting-edge technology combined with design and final assembly in the USA. www.volantidisplays.com. This entry was posted in Cube on February 22, 2015 by admin.